My first show this year was at Levin where Nardine was showing three of her dogs. I arrived at 8.30am and quickly found where the dogs were set up in the gazebo, with crates, mats and grooming table. All three dogs looked fluffy and beautiful with a grooming kit on hand for any touch ups before the dogs entered the ring. Today was all about getting accustomed to the environment, working out the best lenses and settings to use, and the best angles to take photos from. There are natural limitations depending on how the organisers have set the rings in relation to where the sun /direct light is coming from. I also needed to be aware of the angle the judges would have the dogs move around the ring. Before the next show two months later in Ashhurst, I arranged to be on hand to see what it takes to prepare the dogs to look their best. It was a lovely fine, warm afternoon in mid-April when I drove to Woodville for a fun afternoon of bathing, drying and grooming of Enzo and Halo. Halo was first in for a bath without much objection, having been here many times before. Although this did mean she was very good at knowing when to shake and wet any onlookers!! Enzo on the other hand is still very new to all of this and looked a lot more miffed with the idea!! Blow drying the coats was next. This was the longest part of the process but essential before brushing out the coat. Both dogs seemed to enjoy this process, sitting up high on the grooming table watching the world around them while being pampered. It looked to me like the drier doubled as a gentle massage as well with Halo and Enzo lapping up the attention.. I stayed the night at Kiwidinok and was woken on show morning at 6am to a loud chorus of eight huskies welcoming in the day. The morning welcome lasted only a few minutes then all was quiet again until everyone in the house got up for the day. It was a small group of Siberian Huskies showing that day, yet the showgrounds were abuzz with dogs as other breeds got their time in the ring. We were camped next to some very white, fluffy, beautiful Samoyed dogs along with four super cute young pups. 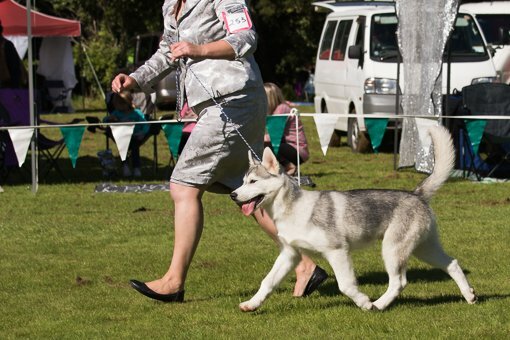 Manawatu Kennel Association Championship Show. mention keep up the fantаstic job!